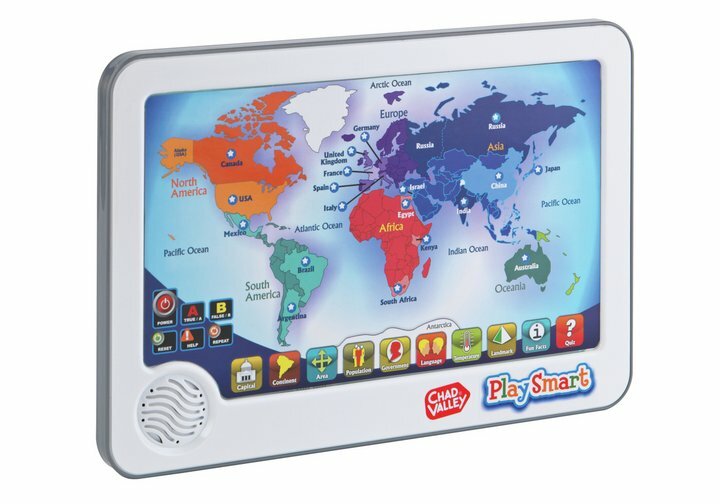 With the Chad Valley PlaySmart Interactive Touch Pad World Map Take you can become an expert on the areas of the globe without leaving the comfort of your own home! Delve into each of the nineteen (19) countries featured and as you 'travel' through them you'll pick up fun facts about geography, special landmarks, inspirational people and language by utilising the easy-to-use interactive touchpad system. With over a thousand (1000) quiz questions to test all that worldly knowledge you've now picked up, this world map is brilliant for expanding problem solving abilities. Get money off with April 2019 free Argos voucher codes, see if there's a promo code for the Chad Valley PlaySmart Interactive Touch Pad World Map product. Argos may be out of stock of this product. To enhance your shopping experience you may also be redirected to a search results page when you click an outbound link. 4.5/5 from 20 recent reviews.